You’d think a pastor who helps people experience “Holy Laughter” would have a sense of humor about it… but you’d be wrong. 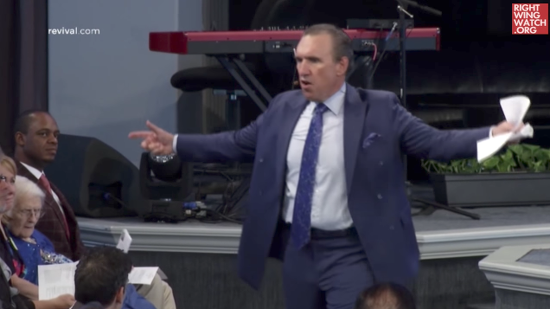 In fact, conservative Christian pastor and conspiracy theorist extraordinaire Rodney Howard-Browne, perhaps best known to critics for praying over Donald Trump in the Oval Office, is lashing out at people who are criticizing his laughter-based religious ceremonies. Howard-Browne says his revivals, which he has been putting on for decades, fill people with the “Holy Spirit” until they have a laughing fit. But now that outsiders are laughing at him, he’s not happy. Some have called his practice “heresy,” but Howard-Browne says they are blaspheming the Holy Spirit. During an appearance on Sheila Zilinsky’s podcast yesterday, Howard-Browne was asked how he deals with the “complete jackals” who criticize his Holy Laughter revival and he responded by warning his critics about the unpardonable sin mentioned by Jesus in the Synoptic Gospels. In Matthew, Mark, and Luke, Jesus warns that any sin can be forgiven except for blasphemy against the Holy Spirit, which Howard-Browne asserted is exactly what his critics are doing. Well, I’m no Christian, but I’ve read the Bible enough to know that Jesus doesn’t pretend giggling is an internal expression of divine power. Jesus didn’t heal someone, and then wait for them to burst into a laughing fit. Howard-Browne is just deflecting. If people are criticizing his laughing shtick, maybe it’s not because they hate Jesus. Maybe they just realize it’s nonsense.